A new mount designed specifically for whiteboards is now available from Chief Manufacturing. 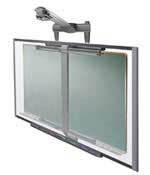 The wall bracket on the Whiteboard Mount allows users to mount an interactive whiteboard over a chalkboard. Chief said the mount offers flexible positioning with vertical, lateral, and depth adjustments. Plus, it mounts to the wall without damaging existing boards, and Chief said it is universally compatible with most boards. Users can also pair it with Chief's short throw mounting system and a short-throw projector and allow the whiteboard to double as a projector screen.